Think about how special it would be if you sang with an Ukulele or danced a Hula during your Holiday gathering. 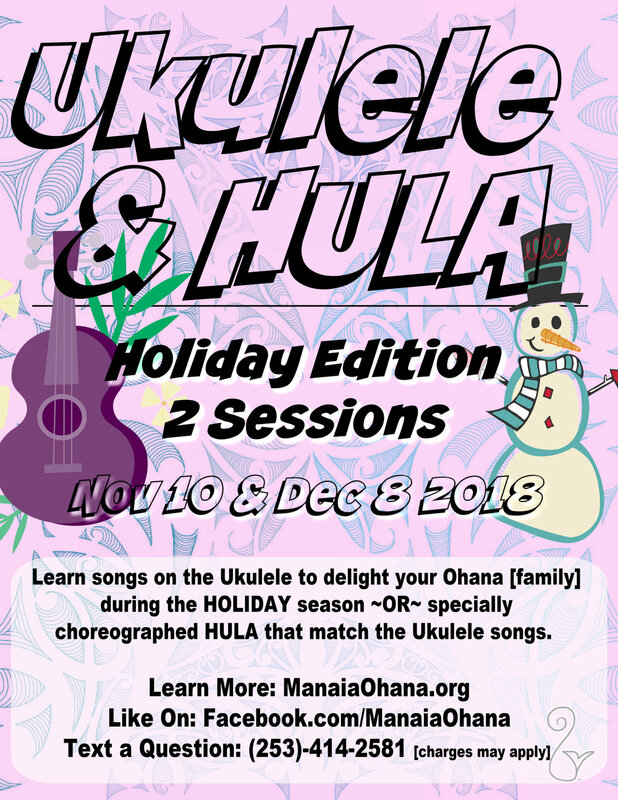 In two sessions we’ll teach you songs that you can use to delight your Ohana this holiday season. We will teach on two separate days as one complete session. You’ll learn on Nov. 10 and practice throughout the weeks then return on Dec. 8 to add a few details. There will also be online sessions as a follow-up to what you learned. In total you’ll get two  classes plus online tutorials for $58.00 which includes everything mentioned and words to the music. The challenge is to only speak Hawaiian during Thanksgiving. Every Thursday from now until Thanksgiving we’ll be hosting small vignettes or tutorials centered around vocabulary for the holiday. The goal is to have you and your Ohana enjoying pumpkin pie through Hawaiian conversation. This is a free community event via our Facebook page, join here.